July saw noCRM.io and Tilkee team up for a joint webinar to talk about how pairing a powerful lead management software with the right-document solution has a significant impact on your sales process and helps boost your closing rate. We delved into our partnership and how it accelerates sales and streamlines processes, enabling your sales team to exceed targets. If you missed the webinar, fear not. We’ve got you covered! Mariana Lacerda, Head of Customer Success at noCRM.io and Kate Pringles, Head of Business Development at Tilkee, walked attendees through how to boost their closing rate using noCRM.io together with Tilkee. How to create leads and move them through the sales cycle in noCRM.io. How to create and send documents in branded spaces in and track page engagement with Tilkee. How noCRM.io and Tilkee work together for a seamless user experience. How to close deals faster leveraging the native Integration. noCRM.io is an easy-to-use lead management software designed for salespeople. The web-based tool reduces the need for data entry and helps you track and close deals more quickly. Boost productivity by creating leads in seconds from different sources such as business cards, spreadsheets, emails, websites, or other apps. 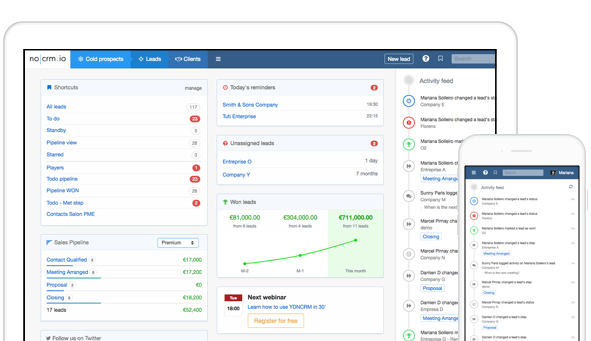 Customize noCRM.io to fit your business reality to best manage the sales pipeline and take leads from end to end. Make sure no action is missed and no important lead is dropped. Tilkee is a cloud document management and e-signature solution designed to help sales and marketing teams increase their operational efficiency. Send branded documents, analyze how, when and for how long your documents are being read, and close deals with an easy and secure e-signature. Revolutionize how you sell.